Home / Products / Seasonal / Petite Fruit Jelly Beans, 1 lb. 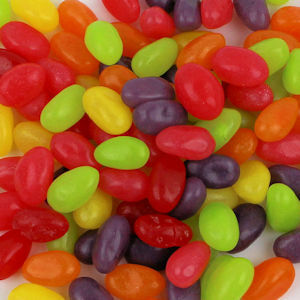 Petite Fruit Jelly Beans, 1 lb. TEENEE BEANEE AMERICANA MEDLEY® Jelly Beans – Classics from coast to coast. Sit back and enjoy a cross-country tour to six luscious locales: La Jolla Lemon, Napa Grape, Chesapeake Cherry, Savannah Strawberry, Indian River Orange and Laredo Lime. Open up and discover a delightfully delicious land with liberty and flavor for all. Sugar, Corn Syrup, Modified Food Starch, Contains 0.5% or less of the following: Citric Acid, Sodium Citrate, Natural and Artificial Flavors, Confectioners Glaze, Pectin, Carnauba Wax, White Mineral Oil, Magnesium Hydroxide and Artificial Color (Red 40 & 40 Lake, Yellow 5, Blue 2 Lake & 1 and Red 3). May contain Wheat, Milk, Peanuts, Tree Nuts, Soybeans and/or Eggs.